Metal production in the prehistoric Andes entailed an array of political, economic, and ritual relationships that are increasingly the focus of archaeological investigation. One theme directing recent research is the link between metallurgy and political organization, including the origins of metal production, its relationship to sociopolitical complexity, and how shifts in the organization of metal production reflect and shape diachronic political transformations. A second theme is the use of metals to identify and interrogate interregional connections. 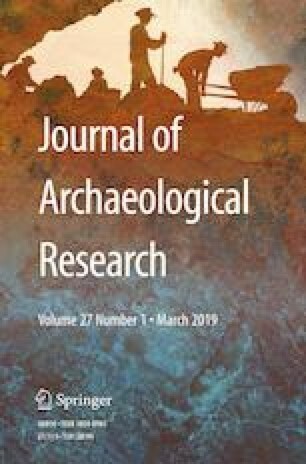 Patterns in the circulation of different alloys and metal isotopes, as well as the transfer of technology, provide insight into the shifting constellations of economic and political connections maintained by prehispanic Andean populations. A final theme is ritual and meaning in Andean metallurgy, where I explore how the stages of mining, extractive metallurgy, and the production of metal objects added multivalent layers of meaning and value to metal artifacts. Operating in distinct ways across time and space, metallurgy in the ancient Andes could stimulate political complexity, drive geopolitical expansion and the integration of new subject populations, differentiate individuals and groups, connect people to one another and to the landscape, and harness the power of the numinous. My gratitude to Gary Feinman for the invitation to prepare this article and guidance along the long road to completion. Images were graciously provided by Mark Aldenderfer, Yuichi Matsumoto, Yuri Igor Cavero Palomino, and María Teresa Plaza, as well as the Metropolitan Museum of Art in New York. Many thanks also to Carol Mackey, Joanne Pillsbury, Izumi Shimada, and David Killick for insightful conversations on Andean metallurgy, as well as the reviewers who provided many helpful critiques. All remaining errors are of course my own.